Is blood and gore enough to save a bad slasher flick? If a film has zero redeeming qualities outside of a few cool deaths is it still worth a watch? 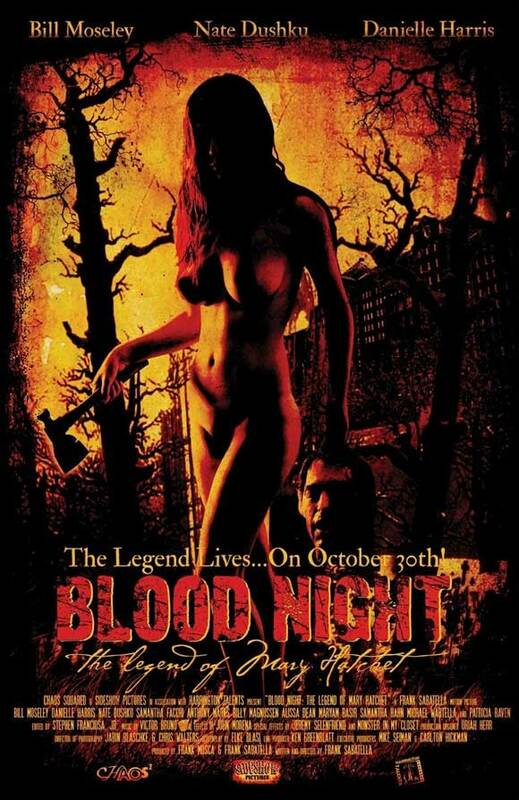 Those questions were running through my head as I sat down to watch “Blood Night: Legend of Mary Hatchet”. This is a slasher flick that should have been amazing. Danielle Harris has the lead final girl? A cameo by Bill Moseley? Some of the most “extreme deaths ever caught on film”? Sign me up! I plunked down my $15 and walked out of Wal-Mart happy, ready to put said dvd into my blu-ray player for a good time. Sadly, the movie is more than a bit of a let down. The set-up is promising if a bit uninspired. A group of teenagers are celebrating Blood Night, the anniversary of the death of a local axe murderer named Mary Hatchet. After their party ends up getting a bit out of control, they suddenly find themselves face to face with the realities of her haunting. As they run from the bloody rampage left behind they soon realize that they’ll need to survive the night in order to expose the truth behind the legend of Bloody Mary. So, what sinks this movie? The awful characters and bad dialogue. Seriously, there are at LEAST 15 teens in this film and every single one of them is obnoxious beyond belief. Guys trying to score with girls, girls getting drunk and making out with other girls, guys fighting with other guys. Rinse. Repeat. There you have the first forty five minutes of “Blood Night”. It’s tedious beyond belief. When the deaths do start happening, the film is done in such a chaotic mess that it is hard to tell who is dying and how. It doesn’t help that there are at least a dozen too many characters. You don’t care about these people. They are assholes and most of them deserve to die in the bloodiest ways possible. Danielle Harris is in fine form here but she isn’t given anything to do until the last act, a last act that is utterly predictable. Still, this is a professionally made piece, some of the deaths are quite well done (loved the scissors through the back of the head and the “spaghetti intestines”) but in the end you really don’t care. Looking for some mindless gore? Have at it. Everyone else? Look elsewhere.